Update! 03/11/14 This form is now an official booking system (rather than an enquiry form). Enter your order below, you will receive an automated response soon after and you will be kept informed of the order. As an Irish Toffee member and to improve your chances of tickets to high profile matches please support your club by purchasing match tickets through The Irish Toffees. For match ticket enquiries, please use this form in the first instance. For other ticket enquiries you can email bookings@irish-toffees.com or tel 086 3837866 (086 EVERTON). Dates listed are original fixture dates, these may change due to TV etc. Please enter your Everton E-ticket number here. 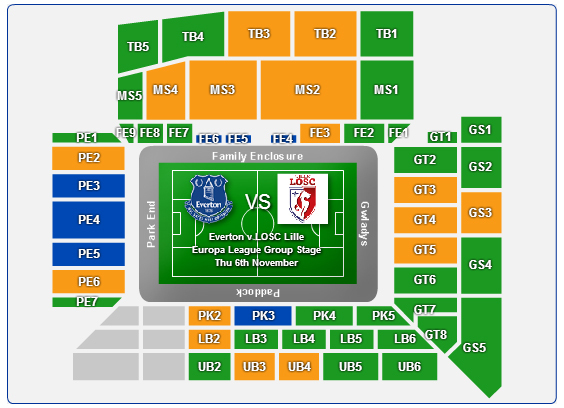 Click on www.irish-toffees.com/eticket.html to see how to obtain your E-ticket number. Please select where you would like to sit at Goodison. We will do our best to accommodate but there are no guarantees. We assume that you want the best possible seats for your party, sitting together. Note: This is just to show the different areas of the ground, it does not relate to actual tickets available.